THE OTHER MORNING when we got to Second String Music, there was a huge and empty cardboard box sitting right in front of the store, flattened out. We wondered who dropped it off. The box was from Walmart and it previously housed a big baby crib, and it still had packing material in it. There was black spray paint on the box, so it may have come from last weekend's Q-Fest, though why it showed up two days later in front of our store is a bit curious. Really, it's been great around here after two huge weekend events. Gus Macker and Q-Fest were both awesome and the area around Washington Park has never looked better. Maybe somebody just wanted to make sure there was at least some debris laying around, so they threw it at our front door. Or, more likely, somebody knew we recycled and figured we'd take care of it. It's fine. I make weekly cardboard runs to the recycle place about half a mile away. I stuffed the box into the trunk along with six or seven empty Jackson guitar boxes, and made a run. I saved a bunch of trees and just felt better about life. So I'm glad somebody tossed a big box in front of the store. 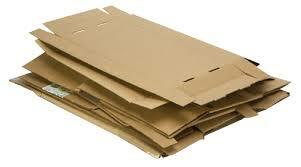 At least cardboard can be recycled.